Fellow judges initially thought they could shoulder the caseload when Judge Gregory Tripp (pictured) retired. 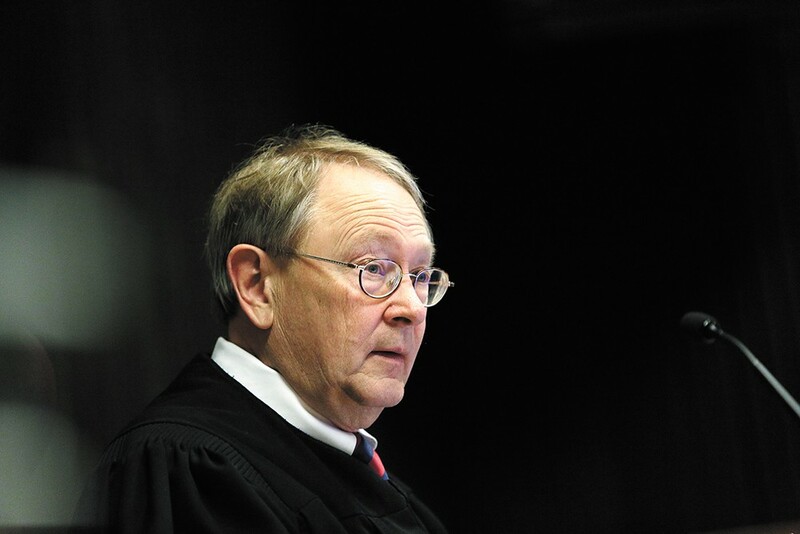 Last fall, Spokane County District Court judges thought they could handle the loss of retiring Judge Gregory Tripp for a year. In fact, with the county looking to cut costs, the district court volunteered to pick up the slack without appointing a replacement. But they didn't foresee the kind of caseload they've had so far in 2018. Namely, district court has seen a staggering 28 percent increase in domestic violence case filings this year, along with a 25 percent increase in driving under the influence case filings over the same period, according to district court Judge Vance Peterson. "I hope it's anomalous," Peterson says. "But I have a sneaking suspicion that the numbers are just going to go up." Based on recent trends, that suspicion of a continued rise in domestic violence and DUI cases looks like it has a good chance of coming to fruition. DUI cases, for instance, have been rising for years in Spokane, prompting Spokane County Prosecutor Larry Haskell to adopt a tougher approach to DUIs in 2016. The rate of domestic violence offenses, too, has steadily been climbing in the last decade, according to data from the Washington State Department of Social and Health Services. In 2016, Spokane County had a rate of 10.4 domestic violence offenses per 1,000 residents, higher than the state's rate of 7.4 offenses. It's led the district court to go back to the county commission to ask for a part-time commissioner, a request granted Tuesday. The rising trend in domestic violence, meanwhile, is one some community leaders are looking to end. County Commissioner Josh Kerns isn't too surprised to hear that domestic violence and DUI cases have gone up. Both are areas that law enforcement agencies across the state have been trying to take a harder stance on. But a 28 percent in domestic violence filings this year compared to last? "It has surprised me they have gone up that much," Kerns admits. The city of Spokane, he notes, added 10 officers to the force in 2018. That could be responsible for some of the increase, with officers more easily able to respond to calls. When asked why domestic violence and DUI cases may be rising, Haskell offers a similar, simple explanation via email. "If filings are up this means that law enforcement has had increased contact with persons whom they believe have committed the crimes alleged," he says. "Violations of law in all areas are of great concern to me. Crimes of domestic violence and driving under the influence are no exception, as they greatly impact victims and public safety." Whatever the reason for the spike, for Peterson and the district court judges, it means caseloads are much higher than they thought. The seven judges were already covering an eight-judge docket. But they've had to cover far more than they thought they'd have to from January until May. "The reality is we need some reinforcements," Peterson told Spokane County Commissioners on Monday. The judge seat vacated by Judge Tripp will be filled in an election this November. And while that judge would be certified in late November, they would still need to go to training in January. Peterson asked the county commissioners to amend the county budget and add a part-time court commissioner starting this month until Jan. 31, 2019. The money won't come from the county's general fund, but rather from the Trial Court Improvement Fund that comes from the state. On Tuesday, the county commissioners approved the resolution for the new part-time district court commissioner. However, Kerns says if the judges had asked for the money from the county's general fund, it would have "changed the conversation." For Ryan Oelrich, the statistics regarding domestic violence cases highlight an important issue for the community. Oelrich is director of Priority Spokane, a nonprofit alliance of community organizations. Currently, Priority Spokane's mission is to bring stability to homeless students. That effort has had promising results and shown progress housing homeless students and their families. The next goal starting in 2019, Oelrich says, will focus on reducing family trauma and violence. Oelrich wasn't shocked that domestic violence filings went up, since it tracks with the recent trend in Spokane County. Rather, he's focused on why it's going up. The original print version of this article was headlined "Overloaded"